GAP first set up shop in San Francisco in 1969, and has since grown to universal acclaim. Today, it is established as one of the world’s absolute favourite suppliers of clothing, footwear and accessories, and a label synonymous with style and quality. With stores in more than 70 countries worldwide, GAP offers a vintage, all-American aesthetic to the global market. With its distinctive blue jeans as a staple for any style-savvy shopper, GAP’s appeal lies in the classic cool of its wares. Throw casual, cosy knitwear and simple, quality shirts into the mix and you’ve got an outfit you can take to the bank. GAP offers everything you could possibly need to craft a wardrobe you’ll love, from socks, tights and boxers to t-shirts, chinos and blouses. With accessories like bags, scarves and hats to add the finishing touches to your outfit, you needn’t shop anywhere else! GAP offers a versatile variety of stylish staples that you’ll want to sport with every outfit, so see what you can find to take your fancy today. How do I use my GAP discount code? Sign up to receive GAP’s newsletter and be the first to hear about news, sales, offers and competitions. Is there a GAP store near me? Have a look at the store finder here to find your local GAP. Do GAP offer a Student Discount? GAP has teamed up with UNiDAYS to offer students a 15% discount, but this only applies in-store, and not with online shopping. What size should I buy from GAP? If you’re unsure about what size garments you should purchase from GAP have a look at the size guide here. GAP is happy to accept returns on all items returned in their original condition within 30 days of delivery. Find the hours of your closest GAP store here. Recognised worldwide as a stylish supplier of cool, classic clothing, GAP has made a name for itself as one of the best and biggest brands on Planet Earth. With an emphasis on quality and comfort, GAP is a label offering excellent clothing, footwear and accessories for men, women and children. Tap into this iconic brand for less with a GAP discount code. Whether you’re after some new swimmies or a warm new winter coat, you’ll love what’s on offer from GAP. 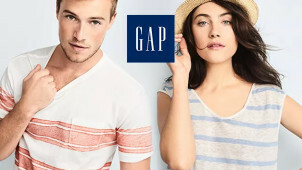 GAP is universally popular and has nearly 4,000 stores globally. It is renowned for the steadfast quality of its products, as well as its singularly stylish approach to it design. Its GAP 1969 jeans are emblematic of its timeless, classic style and are a serious staple in the wardrobes of many fashionistas worldwide. Far from flash-in-the-plan, GAP doesn’t run around trying to keep up with latest short-lived trends, and instead offers timeless fashion solutions. When you’ve got a bun in the oven have a look at GAP’s incredible maternity wear. Online-exclusive and exclusively stylish, there’s a wide range of styles on offer to keep you feeling trendy throughout all three trimesters and beyond. There’s incredibly low prices on offer to suit all price ranges, and when you shop with a GAP voucher code you can chip a further chunk off the cost of your maternity wear. For stylish, comfortable solutions you’ll love nearly as much as the bundle of joy itself, pick GAP.